In 2006, Desert Sun Mining & Gems witnessed a significant change in the mining operation at the Ponderosa Mine. 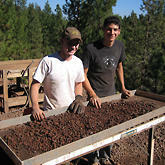 Prior to 2006, all of the mining was performed by hand using shovels, picks and hand screening. "Although this method was adequate for our business for the first three years, new customers and demand for the product required that we update our processes to produce the quantity anticipated for 2007 and beyond." Said John Woodmark, President and CEO of Desert Sun Mining & Gems, the company that owns and operates the Ponderosa Mine. In August of 2006, Bruce Moore, Gene Hatlelid and Jerry Dumolt began more than a month-long process installing a wet trommel that DSMG purchased in California and modifying a dry trommel that was half custom built and half ODOT sand spreader married up to the tumbler. All of the new equipment was conveyed to the mine site on lowboy truck and trailers supplied by Rick Day of Advantage Concrete. Rick was also instrumental in designing and building the tumbler end of the dry trommel. After very carefully unloading the massive pieces of equipment from the low-boys using the shovel end of a Case back-hoe, the equipment was towed up the unimproved roadway from the closest Forest Service road to the mine site (about 800 yards). Once at the site the crew positioned the wet trommel and performed some preliminary maintenance to make sure it would operate. The crew then turned their attention to the dry trommel, which required that retaining walls be built out of railroad ties positioned in-between steel posts set in concrete for stability. The tumbler section of the trommel was then installed on the walls. This was done to position the feeder on the road above the tumbler for easy loading access. As with anything built from scratch, a number of things had to be modified to make the trommel work properly given the material going through it and the volume to be processed. After installing a larger electric motor, several drive belts, a number of sprockets, new wheels for the tumbler, welded roller sleeves, etc. the operation wound up with a great piece of equipment. The operation also tapped into two springs above the mine site and brought water 1200 feet down to the site in 1 ½ inch polypipe. Standpipes and faucets were installed at the mine campsite and continued across the face of the mine to a 3600-gallon water tank that was positioned on the side of the hill above the wet trommel. 2-inch polypipe was brought from the tank down to and under the access road to the mine and attached to the wet trommel. A little later John Woodmark, Jim Talley and crew showed up and processed the concentrate that had been stockpiled throughout August and September of 2006. Picking and grading tables at the out-feed of the trommel were installed and with a minimal staff, the newly mechanized operation is now processing around 50 kilos (110 lbs) of crystal a day. Previous to building a one of a kind replica watches uk, just one have to primary have any ingenuity in addition to curiosity. When you decide to give ones dollhouse having a collection of miniatures obtained in another place, perhaps it will receive a little high-priced. Most of these replica watches sale usually are sturdy in addition to tasteful with appears to be in addition to types. Skin many replica watches uk for women. The item is amongst the at best were located corporations which enables sturdy wristwatches subsequently and from now on. As soon as persons invest in wristwatches, they should be retail outlet in case previously you don't own the perfect time to roam all around to go, you possibly can head out replica watches sale on the net throughout the world-wide-web.